Here begins our discourse concerning the spirits of plants, their natures, conditions, various properties, uses, and humours. Let all those who would dwell in woe read no further, for the Alliance of the Green is a family of harmonious interdependence: intersupporting, yet maintaining each member thereof its complete integrity, whereby men and women might learn from this economy. And let all those who would seek an end to mystery read no further, for that which we present is but a shadow of what there is to be known of our green blooded cousins. Knowing, therefore, that experience is the best teacher, we urge our readers to test the informations we give in these utterances; to [retain] what seems [useful] and to discard what seems not. And we ask Isis and Osiris, Pomona and Vertumnis, Maria and Yeshua, Flora and Ceres, Rhea, Demeter and Ops, all the consciousnesses of forest, fields, vacant lot, roadside, streamside, and dung heap—all these we ask to guide us we write, that our words may accurately represent the world as They view it. If there is a plant whose virtues you wish to discover, it is first necessary to identify it as accurately as possible. For this, the botanies are invaluable. Take note of the date and time you discovered the plant; the location and placement of it; its leaf and flower color, if any; how the leaves are arranged on the stem; how tall it is, and how broad; whether it springs up from the roots or from fleshy underground storage organs; whether it looks healthy and happy or ill and sad; whether it is insect-riddled or has suffered little damage from predators. Observe also whether there are others of its kind dwelling nearby, or if it is a solitary specimen. Do not pick it. If you are no artist, or cannot capture the plant’s image on film, one or two leaves it is permitted to take; but in your world of vanishing plant-forms it should be considered as criminal to kill or harm a green sibling for mere curiosity’s sake as it would be to kill or maim an animal for the same reason. Go home to your botanies, and seek the plant therein. Ask the plant in meditation to help you to identify it. Talk to locals. The information will present itself in due course. Next, distil the Rosemary with the water in a Bain-Marie. [Permit to cool, then] apply as a mist or splash to the Throat Chakra. To understand religious or spiritual mysteries, add to the Rosemary the shredded root of the Vetiver plant or Khus-Khus. To understand the needs and motivations of human persons or beasts, add to the Rosemary [chopped leaf of] Juniper. For understanding the causes and solutions of practical problems, add [the crushed dried buds of] Clove. For understanding the next step in the progress of an artwork, [literary endeavour], or creative project, add [both flowers and leaves of] Lavender. For understanding the proper time to do something, add [flowers of] Chamomile. For understanding the speech of [beasts], birds, and plants, add [the flowers or leaves of] Thyme. For understanding your self, add nothing, [but employ the Rosemary only]. 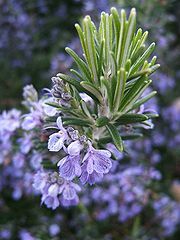 The [true, pure, unadulterated essential] oils [of the above plants] may be used [instead of their parts], no more than 8 drops to [each] pint Rosemary Water.